Ready! Set! Action! Roll the cubes and tell a story, but this time, the focus is on the actions that take place in the story, not just the who or the where. With 54 actions depicted on the cubes, the stories told around your gaming table will never be short of motion and commotion! Rory’s Story Cubes – Actions is comprised of 9 six-sided cubes. On each face of the cube is a unique image (54 in total) that represents an action. The cubes are heavy without being bothersome and easy for little hands and big hands to role. The images are surprisingly detailed, too, making it easy to distinguish what action the image is attempting to represent. Although, what the action is or what it might represent is up to the individual to decide. Game set up is exceedingly simple. All that is needed is a central playing area in which all the cubes will be rolled. That’s it! Time to play! If you are combining Rory’s Story Cubes – Actions with Rory’s Story Cubes, pick which cubes you want to use from each set but no more than 9 in total. This allows for 3 cubes to be used for the first part of the story, 3 cubes for the middle part of the story, and 3 cubes for the conclusion of the story. Of course, since there are no rules, feel free to mix and match as you see fit. This is especially nice after you’ve played one or both games separately a number of times. After so many games, you begin to see the same images again and again, and while the stories might never be the same twice, the same story elements might reappear. 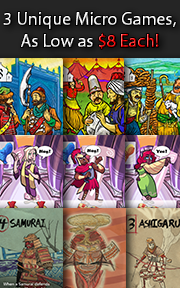 By introducing the two games together, you get more variety in your stories and reinvigorate the game play. When you want to separate the cubes, simply do so by color. Rory’s Story Cubes – Actions depicts its images in blue while Rory’s Story Cubes depicts its images in black. Like the original Rory’s Story Cubes, this game has no set rules of play allowing for flexibility and freedom. Gamewright offers four different games that you might consider playing before you invent games of your own. Use the actions depicted on the cubes to practice verb tense by telling a story in the past and then tell the same story in the present using the same cubes, followed by telling the story again in the future. Pick a title of a movie you like and then use the actions depicted on the cubes to describe that movie’s characters or elements. Instead of using the action depicted on the cube, use the action that is the direct opposite. For example, if the action shows a rocket crashing, you’d use the action of a rocket flying through space or landing safely. Whenever you use an action depicted on the cube, act it out instead of just saying the action in the story. These are just four of the many ways you can use the cubes to play! With no set rules you have zero limitations and are free to use your imagination to come up with new games using the cubes. See the games’ web site at Gamwright for more information and visit the game’s official web site for more ideas on how to use the cubes. I have no doubt that my little geeks will enjoy the action version of the Rory’s Story Cubes game. It is, to be blatantly honest, the same game. The only difference is that the cubes are specifically depicting actions. This should add much more creativity when I combine the two games together. Played as a separate game, I expect it to play exactly like the original. After I showed the game to my little geeks, they had the following to say. Looks like my geeks are less enthralled by this version of Rory’s Story Cubes and I can understand why. It’s not that the game is any less exciting than the original, it’s because they’ve played the original a lot. It is very possible they are suffering from “Rory’s Story Cubes Burnout”. Regardless, they are willing to play as they know they will have a good time. To answer my 4-year-old’s question, yes there is a cube that depicts a fight. Let’s play the game and see if the new cubes reinvigorate their interest. Let’s get the obvious out of the way first. Yes, this version of Rory’s Story Cubes plays the exact same way as the original version. Seamlessly, in fact. There is no new learning curve and you can introduce the game using either the Action set or the original set without ever fearing that you are somehow cheating the players. Both are great and do their job very well. But as fun as both sets are individually, they are doubly so when combined. The real magic happens when you combine the two sets. Your stories become more dynamic as Rory’s Story Cubes – Actions add a kick to the story being told. This was immediately apparent when I combined the two games and we tried a story using both sets. My little geeks told stories with more action and drama as the characters grew in proportion and life. This injection of new energy sparked my little geek’s interest in the game again and they were just as excited, if not more so, as the first time they played the game. You will also be pleased to know that my little geeks did not fall into the same trap they did the very first time they played the game. This is where they used the cubes at face value, using exactly what was depicted on the cube in the story. They both interpreted the cubes, using sometimes the action depicted and sometimes using the image to introduce new characters or epic changes in the story. I thought this showed a great use of their imagination and their understanding of how images can represent many things and not always the same thing to a group of people. For example, there is one image that is not terribly clear what the action is. I see a person sleeping, my 7-year-old sees a person crying, and my 4-year-old sees a person swimming over a waterfall. This fascinated my little geeks and they began to immediately argue their case concerning why they were right. Gamer Geeks, like Rory’s Story Cubes, this is not a game for you. The cubes are meant to generate story ideas and that’s all. The lack of a game with in-depth strategy and tactics, deep game play, and meaningful decision making will turn all but a very few Gamer elitists off. For those who do want to give this game a try, they will find it entertaining but hardly a game that will see the gaming table on a regular basis. Parent Geeks, like the original game, this promotes vocabulary growth and creativity. The cubes can be used in many different ways allowing you to play the game with your little geeks to help them learn new vocabulary words and strengthen their self-confidence. One image does depict an act of violence (two characters wrestling) and another with a character who looks like a thief. Rather than avoid these cubes, I encourage adults to use those images to learn more about how their little geeks feel about what action is being depicted and use it as an opportunity to discuss right and wrong behavior. Educators should again take special note and consider using these cubes in their classroom to help promote vocabulary, speech, and creative writing. 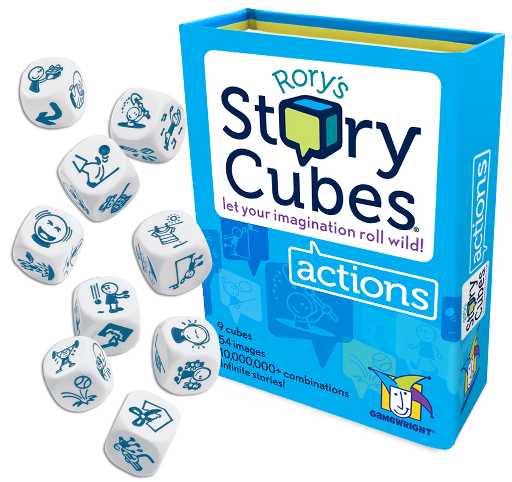 Child Geeks, this version of Rory’s Story Cubes will add actions and more excitement to your story. Lifting, jumping, kicking, explosions, and even eating what appears to be a pizza or a giant cookie! You’ll have fun incorporating these images into your story to make your characters come to life even more and make your stories like actions movies! Play it separately or add it with Rory’s Story Cubes to create even more possibilities! The big question that has yet to be answered is if Rory’s Story Cubes – Actions is as good or better than the original. The answer is a definite “maybe”. The cubes do not take the game in a new direction but do add additional ideas. They are, again, just meant to stimulate the mind and help facilitate the stories. That being said, what the cubes provide is 54 more unique images to be included in epic stories around the table. Their value will ultimately be determined by their use by you. Personally, I love Rory’s Story Cubes – Actions but no more or less than the original. I see the game as a natural fit and continuation of the game play introduced in Rory’s Story Cubes. Kind of like adding a new room to the house. Still the same house but there is just more of it to use. This is exactly what Rory’s Story Cubes – Actions provides: more story and more room to play. It works great as an expansion and as a separate game, has all the great things I loved about Rory’s Story Cubes without detracting anything from the game play. It lets me add to my game experience without adding bulk. A perfect example of what an expansion should be, and yet, it plays great by itself! 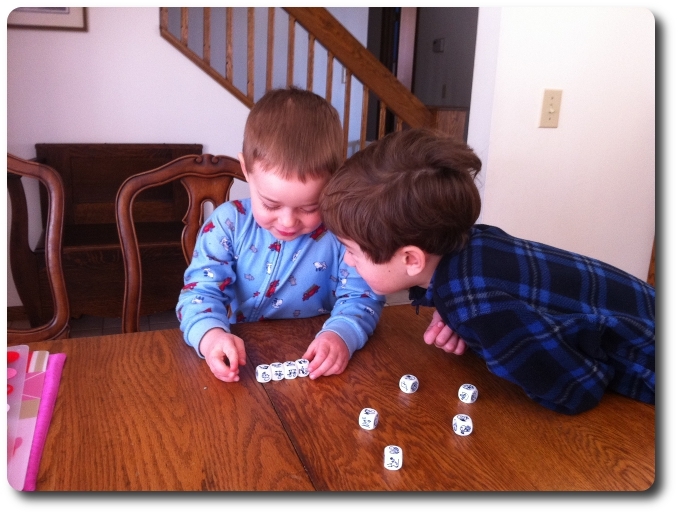 For this reason, I give Rory’s Story Cubes – Actions two very enthusiastic thumbs up! 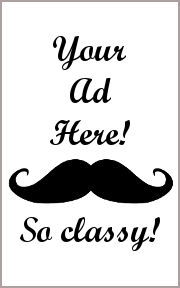 Tagged Dice Games, Parent Geek Approved, Party Games, Storytelling Games. Bookmark the permalink.